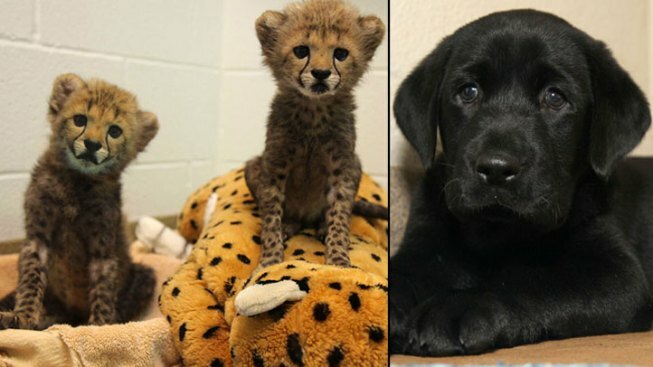 Winspear, left, and Kamau, the Dallas Zoo’s new 8-week-old cheetah cubs and Amani, the cubs’ puppy companion. The Dallas Zoo announced Thursday it has two new cheetah cubs, and those new cubs will grow up with a companion puppy. The cheetah cubs, Winspear and Kamau, were born July 8 at the Smithsonian Conservation Biology Institute in Front Royal, Va. A team from the zoo spent nearly two weeks in Virginia before flying back to Dallas with the cubs. 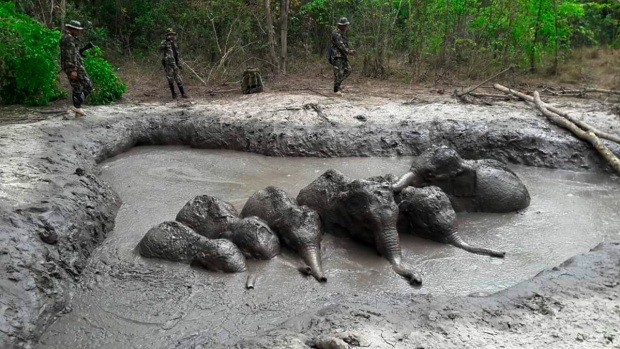 Eventually they will be part of the zoo's Animal Adventures outreach program which teaches the public about conservation efforts for highly-endangered African animals. The cubs will be raised with an 8-week-old black Labrador puppy named Amani. Zoo experts said Amani will be a calming influence for the cubs as they get used to being in public. According to the Dallas Zoo, Amani means "peace" in Swahili, the language of East Africa where cheetahs still exist in the wild. "It is a thrill to be able to tell the story about cheetah conservation and to educate Dallas Zoo guests about this magnificent species," said Sean Green, of the Dallas Zoo via news release. "Winspear and Kamau will become important animal ambassadors for the Dallas Zoo, building appreciation and awareness about cheetahs to more than 900,000 visitors each year." The zoo says their black spots and unique "tear stripes" below their eyes are already evident and while the cheetahs are smoke-colored now, they will get their golden color as they get older. At 8-weeks-old, Winspear, the larger of the two, now weighs more than 8 pounds, while Kamau is over 6 pounds. When they are full grown, the cheetahs will stand about 3-feet tall at the shoulder and weight up to 140 lbs. Don't expect to see the cubs if you're visiting the Giants of Savanna cheetah habitat. The zoo said you'll be able to see them in person at the Wild Encounters stage and next year the zoo will open a cheetah run where the world's fastest mammals can be seen coming close to their top speed of 70 mph. Below, see adorable video of the cheetah cubs playing!